"Don't pay any attention to what they write about you. Just measure it in inches." 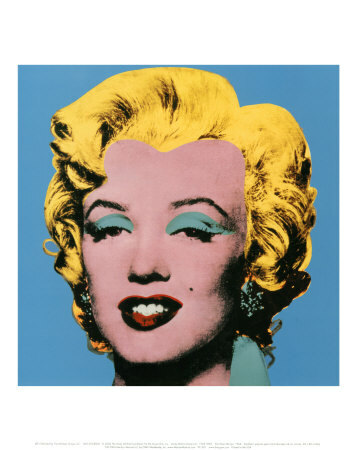 After Marilyn Monroe’s death, Pop Art founder Andy Warhol spent four months making silkscreens based on a publicity still of Monroe from her film, “Niagara.” Fusing art with mass production, Warhol created brilliantly colored multiples of her image. Fascinated by morbid subjects and celebrity, he symbolized Monroe’s mortality, and her media saturation through brash, assembly-line reproductions of her face. Recommended books on Andy Warhol: The Philosophy of Andy Warhol : (From A to B and Back Again) by Andy Warhol; Andy Warhol 365 Takes: The Andy Warhol Museum Collection by Staff of Andy Warhol Museum; Andy Warhol: Giant Size by Editors of Phaidon Press, Steven Bluttal, and Dave Hickey; The Andy Warhol Diaries by Andy Warhol and Pat Hackett; Andy Warhol Prints: A Catalogue Raisonné 1962-1987 by Arthur Danto, Donna De Salvo, Andy Warhol, and Claudia Defendi; Andy Warhol Portraits by Tony Shafrazi, Carter Ratcliffe, and Robert Rosenblum; Andy Warhol Idea Book by The Andy Warhol Museum. Available here are these Andy Warhol posters and prints, among others: Andy Warhol - Sun, Andy Warhol - After the Party, Andy Warhol - Marilyn Monroe, Andy Warhol - Elvis, Andy Warhol - Banana, Andy Warhol - Portrait, Andy Warhol - Self Portrait Orange, Andy Warhol - $$$, Andy Warhol - Warhol R Pop, Andy Warhol - Self Portrait, 1966-67, Andy Warhol - Speed Skater, Andy Warhol - Lips, Daisy, c.1982 (fuschia & yellow), Andy Warhol - Diamond Dust Shoes 1980 (lilac, blue, green), Daisy, c.1982 (blue on blue), Andy Warhol - 10 Marilyns 1967, Andy Warhol - Campbell's Soup I (Tomato) 1968, Andy Warhol - Ads: Life Savers, 1985 (blue), Andy Warhol - Ads: Life Savers, 1985 (pink), Andy Warhol - Four Monkeys (sm), Andy Warhol - Portrait of Maurice, Andy Warhol - Cow 1976, Andy Warhol - A set of Six Self Portraits, Andy Warhol - Mickey Mouse.